I am thrilled Janet is visiting today! Some ice creams are worth screaming about. As a child, I was spoiled by occasional summer evening outings to a dairy outside Pittsburgh where the ice cream was made on site from real cream and other delicious ingredients. I was small. A single scoop—usually chocolate–in a cone was enough. As I mentioned at Mystery Lover’s Kitchen recently, I discovered hot fudge sundaes in which the fudge was thick and semi-sweet. That was in Michigan. 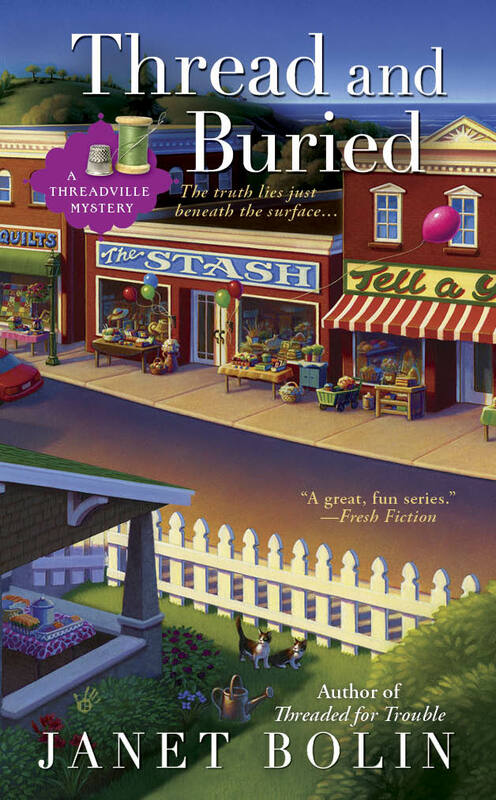 My third Threadville Mystery, Thread and Buried, hit store shelves yesterday. Thread and Buried features buried treasure, a years-ago mystery, and a body shrouded in materials from Threadville Shops and left the backyard of my main character, Willow. About the same time, two kittens mysteriously show up. Could any of these things be connected? Poor Willow! When the going gets tough, the tough go shopping. 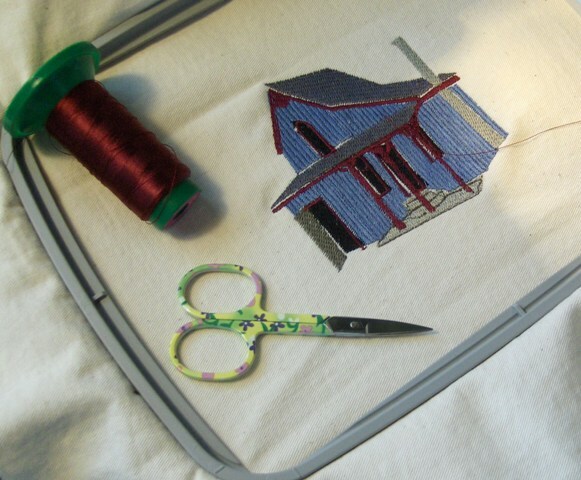 Willow’s apartment and machine embroidery boutique, In Stitches, are in the village nicknamed Threadville. Willow, her dogs, and her sidekick, Haylee, can walk down the street past the fabric store, yarn shop, notions shop, quilt store, and home décor shop to a wide, sandy beach on Lake Erie. A pleasant walk along that beach takes them to a colony of lakeside cottages where the residents spend a hard day at the beach and then cook their supper on the barbecue. For dessert, the cottagers become formal. They slip T-shirts over bathing suits and flip-flops onto feet, and they stroll to the closest ice cream stand. And that’s where Willow and Haylee (and the dogs) head for dessert, too. I won’t give anything away, but I have to say that those trips sometimes yield other things besides dessert, and too often for Willow and Haylee, the trips don’t yield any ice cream at all . . .
Another of the great things about living near a lake is that friends have been known to take me by boat for ice cream, though I have to admit that my boating ability is severely lacking. Last summer, I nearly got tangled in that ladder going down the side of the wharf. Like Willow, I sometimes have trouble deciding which flavor to choose, and I often fall back on an old favorite—mint chocolate chip. You thought I was going to say chocolate, didn’t you? Can you decide which flavor of ice cream to order? Do you have a favorite ice cream stand? If you live near Oneonta, New York, check out Pie in the Sky. Driving up and down the Susquehanna nearby, you may even catch a glimpse of the cottage that inspired Willow’s Blueberry Cottage, if flood waters haven’t, ahem, convinced it to move away. Dire Threads, the first book in Janet Bolin’s Threadville Mystery series received a nomination for an Agatha Award for Best First Novel. It was also shortlisted for the 2012 Bony Blithe. 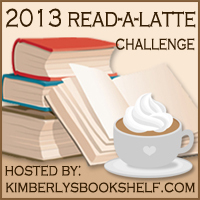 Janet’s second book,Threaded for Trouble was shortlisted for the 2013 Bony Blithe. Her third book, Thread and Buried came out yesterday! All of her books can be ordered at your favorite bookstore. Every town has a legend. For Threadville, it’s the story of Snoozy Gallagher, the hotel owner who disappeared thirty years ago with a bag full of stolen jewelry, never to be heard from again. That is, until now—when Snoozy’s loot is discovered buried behind Willow Vanderling’s embroidery shop In Stitches. I have loved each and every trip to Threadville. Bolin just keeps getting better and better at keeping us In Stitches. This time she pulls out the stops with a village legend that gives us a mystery tangled in another mystery and then some. All our favorite characters return. Opal, Naomi and Edna are in rare form and the center of a couple of surprises. Clay is doing some work for Willow so he is always around as the almost romance is set to simmer. Haylee continues to help Willow to NOT stay out the investigation and Tally-Ho and Sally-Forth are along on the “walks”. Sally even finds some new friends. This was a book I just could not put down. I was up reading late into the night and then the author left me wanting more. The last chapter, the last line, leaves us with a smile 🙂 The next installment can’t come fast enough for me! 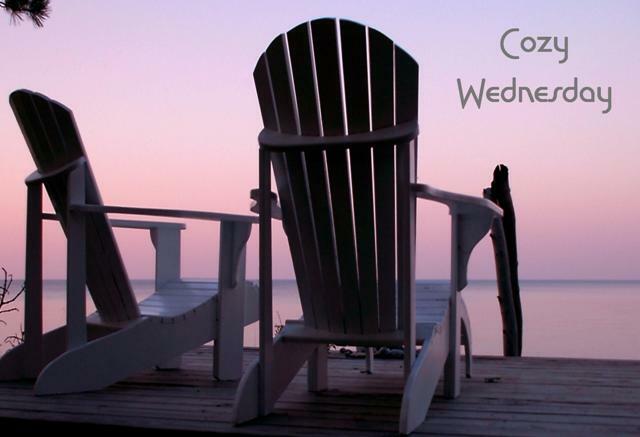 Leave a comment for Janet for 5 Bonus Entries ! Can you decide which flavor of ice cream to order? Do you have a favorite ice cream stand? Burgundy Cherry or chocolate with black cherries from Coldstone. Looking forward to a trip to Quad cities to see if Whitey’s shakes are still the best. My favorite flavor is Hood’s Red Sox Comeback Caramel found at the grocery store. Guess I would have to say Chocolate Chip is my favorite ice cream. Favorite places to get it at is either in Nashville, IN. or up in Door County, WI!! Have been looking forward to this newest addition to Threadville series!!! My two favorites and mint chocolate chip and vanilla bean – sometimes I just want the simplicity of vanilla ice cream! I prefer to get my ice cream at the grocery store- no favorite stand. Thanks. Those are among my very favorites, too. Alicia, you sound like my main character, Willow! My favorite ice cream flavor of all time would have to be new york cherry cheesecake. I have an ice cream shop a few blocks from my home where I can get it now and its great. Thanks for the giveaway. I love ice cream, and I rotate between three flavors, Chocolate Peanut Butter, Mint Chocolate Chip, and finally Cookies and Cream. Thank you for this stroll down memory lane, and thank you for this lovely giveaway. It is fun remembering ice cream adventures, isn’t it! My favorite ice cream is pistachio I especially love gelato but I remember stopping at a Rusty Custard Stand years ago with my grandfather and getting a vanilla custard used to think it was the best in the world, always looked forward to that trip..
Ice cream with grandparents probably is the best in the world! My favorite flavor right now is chocolate with chunks of chewy chocolate brownie pieces. I don’t know if any stands sell that kind, but that is what tempts me the most at the grocery store. Probably my favorite ice cream stand is the one in Ed’s Pitstop gas station in Birchwood, Wisconsin. 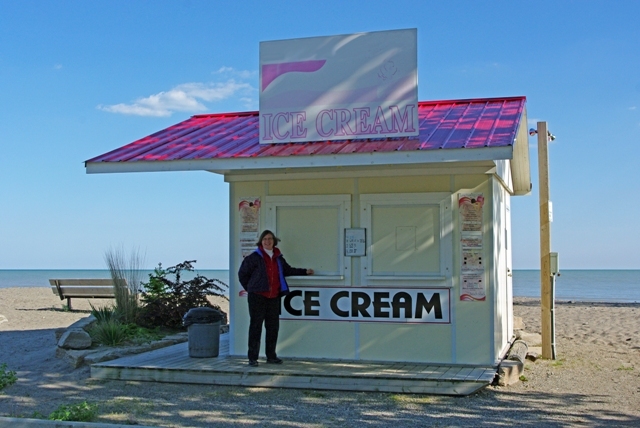 The picture of you in front of the ice cream stand made me think of a place on Lake Mille Lacs in Minnesota, but I have only been by that in the fall, after the summer season was over. But it looks like a fun place to visit. Elaine, I was laughing because the stand was closed. I was ready for ice cream, and it was the Saturday of Memorial Day Weekend, and too cold for ice cream! Really? Who determines how cold is too cold? Ice cream cravings know no temps! I love strawberry ice cream. I haven’t seen an ice cream stand in many years. Rita, maybe my dogs help me sniff out ice cream stands. Willow’s dogs certainly do! I love chocolate ice cream. I moved to Texas and we can get Blue Bell ice cream here it is wonderful. I also love pumpkin ice cream in the fall. I don’t know of any ice cream stands near me. Caramel, yum. Lucky thing we don’t get to choose between all of these flavors at once–I’d never make the decision! Leanna, are there shops that sell mostly ice cream? They’re just as good! My favorite Ice Cream is Raspberry twist at our local dairy bar. LOL..I also have a taste for Butter Brickle hard Ice Cream on a cone from there..I’m in the Southern Tier of NY so we did get hit hard with flooding several years in a row. I know some of the places you mentioned in your interview..lol. rojo13864, the Southern Tier has not forgotten about ice cream stands, one more thing that makes the area wonderful. The floods were really something,though. Mmmmm. Butter Brickle. Haven’t thought about that flavor for years! I find it hard to decide. Sometimes I wish I could stand there for an hour and look at all the flavours! I usually choose chocolate or vanilla. No, I don’t have a favourite ice cream stand. Jennifer L., I’ve been known to stand for a long time making up my mind, too. Maybe that’s part of the fun. My favorite flavor is chocolate ripple. Love the combination. AN ice cream parlor that is old fashioned and special is in Wildwood, N.J. Simply wonderful. Ice cream, yum, especially Vanilla bean. SO good. I haven’t seen ice cream stands ever but ice cream dairy way back when I lived in Mtl. was an evening trip during the summer. So special. Ellie, yes to vanilla bean! And to ice cream dairies. Favorite ice cream: chocolate peanut butter!! ruthhill174, yes, yum, that’s a good one! My all time favorite is Mint Chocolate Chip although I also love Rocky Road. There are no ice cream stands around- I have to buy my ice cream at the grocery store. Looking forward to this next installment in the Threadville Mystery Series! When we were young, Mom would mix up homemade icecream, usually fruit.Banana usually. My favorite is usually raapberry or cherry. Since I’m diabetic now, fewer choices, but usually a fruity one. ndluebke, the important thing to me is the ice in ice cream, not the cream (I know, I know, shouldn’t admit it) or the sugar. Anne, wouldn’t it be wonderful to tour all these places? The Dream Ice Cream Tour! Not many ice cream stands in my town, and the ones that are here are priced so high that I can buy 1.5 quarts of ice cream and a box of cones for the price of one cone at the stands. Peggy, yes, don’t tell Willow, but she could make her own ice cream cones. But I think she likes those strolls on the beach with Haylee, Tally-Ho, and Sally-Forth. Of course, she does sometimes get distracted and end up with no ice cream. So she should stock it and a box of cones at home! Thanks, Amanda Ray! Yes, I love mint chocolate chip! Here in St Louis, we have Ted Drewe’s. Although I’m not a huge ice cream fan, their concretes are pretty darn good!!! My fave is The Frisco with coconut, pineapple, sour cherries, etc. Yummmm!!! It’s fairly far away though so if I’m really craving something quick, Dairy Queen and their Peanut Buster Parfait are about two minutes away, lol. Cindi169, I can take or leave ice cream in the winter, but in the summer, it’s a food group. Ha ha!! You are so right Janet!!! Vesper, you can’t go wrong with organic, all natural, chocolate chip or vanilla. Yum! The Threadville Mystery series sounds very interesting. Since I am a sewer and quilter, I will definitely be putting this series on my TBR list. Thanks for sharing. Thanks, BookLady! Who doesn’t like chocolate ice cream? Oh, I know! my mother complained that it wasn’t chocolatey enough. She’d have liked the fudgier versions. My favorite ice cream is Chocolate Marshmallow ( no nuts.. ) and..my favorite ice cream stands are the “Dairy Queen” stands / restaurants that we have here in Kansas..
My favorite is black cherry. I don’t have a favorite place to go to get ice cream really. Yum, Linda, Black Cherry! Haven’t had that one in awhile, but I can just taste it. Thanks, Melissa! I hope you enjoy the rest of the series. All this talk of ice cream flavors and stands is making me hungry! Sherbets, ices, gelatos, they’re all good… Now I’m getting *really* hungry! I like these flavors when I can find them peach, and party cake. I remember some delicious homemade peach ice cream once-mmmm. Party cake? I don’t think I’ve ever tried it! I still like butter pecan the best. Because I live in a small town, there is only one ice cream shop. So, there is no choice, but the ice cream is great. Thank you, Llk10retired! One of my aunts loved butter pecan, and that’s what she served. I love it now, too, but then I probably preferred chocolate. MMMMM Ice cream—I remember the homemade ice cream from my childhood. It was out of this world and of course, I never got the recipe from my mother. My favorite ice cream is dark cherry—maybe with a little chocolate drizzled over it. No ice cream shops near here so I just must make due with the grocery store. That homemade ice cream was delicious! I remember one vanilla one that was especially yummy. Maybe it had something to do with waiting, and taking turns with the crank? All that exercise–and anticipation! Funny, my default flavor is mint chocolate chip too! Sometimes I get more adventurous, but not often. There aren’t really any good ice cream shops near me. Can’t wait to read more of Willow’s adventures! Thanks! Thanks, HoldenJ. Willow’s adventures involve ice cream, well, she hopes… Strangely, I I never buy mint chocolate chip in the grocery store. Maybe the ones near me don’t carry it? But when it comes time to choose an ice cream cone, I often end up with mint chocolate chip. Aaah, so many flavors, so little time! The best flavor I have EVER tasted is peanut butter and chocolate. Tammy, I tried peanut butter and chocolate recently for the first time. I liked it. A lot. Love coffee Ice cream.There never was a ice cream stand in my area. I have several favorites Mint Chocolate Chip, Butter Pecan and Cherry Chocolate Cordial- mmm good. In Warren, we have Handle’s Ice Cream which is all homemade – originated in Youngstown and was the best kept secret for many years. Located in an alley you really had to know it was there to find it – the parking lot was always full. Another more recent favorite is Katy’s Korner – another winner. I can remember (ouch – going back to the 60’s) when one of the downtown Youngstown department store restaurants had Pecan Butter Balls. It was a Ball of Vanilla Ice Cream rolled in crushed pecans and served with Chocolate Syrup over it. That was dinner a number of times when I was going to college. Strouss-Hershberg’s Department Store had a Chocolate Malted (kind of like Wendy’s Frosty but much better. That was a special treat if you were really good on a shopping trip. Thanks for bringing back the memories and for a wonderful series. I go to two places. The closest one is called The Snowman. Been there for maybe 50+ years. No special flavors there for me. The second place is called The Ice Cream Man and takes 35 minutes to get there. They were featured on the Food Network channel with Bobby Flay’s Throwdown. I love their Hugh’s Chocolate Overload ice cream. It’s dark chocolate ice cream with chocolate syrup swirls and chocolate chips. Karen, those sound wonderful. Really, a tour of ice cream shops/stands/parlors is a must! I love Chocolate Almond Ice Cream. Where I grew up we had the Dairy Barn and even though I worked there I still liked to stop and get ice cream from them. I love coffee ice cream and a summer ice-cream place in Mansfield, Pa called Little Half PInt has Capuicino Crunch so I sometimes order that. If I watch diet more – I order sugar free butter pecan or the other sugar free. Though there was a place in New Hope PA that made the best rum raison and other interesting flavors. Rachelle, I’d love trying that cappuccino crunch! Maybe Willow and Haylee will have to make a trek down to Mansfield. Although also in PA, it’s pretty far away from Threadville! Angela, chocolate almond sounds great, too. You know a food is good if you work there and still like it! Hmmmm. I wonder how chocolate almond butter ice cream would be? I love Strawberry Cheese Cake ice cream. Kiki, so many tempting flavors out there! Love the title, thank you for the chance to win this book. Thanks, Wendy! My friend Daryl Wood Gerber, who also writes as Avery Aames, came up with that title. Yes I have a hard time choosing a flavor of ice cream. It depends were I go for ice cream, some places don’t have many flavors. Diary Queen is vanilla, Country Style is chocolate, but if I go to Whitey’s I’m lost. These are my favorite ice cream places to go. Your book sound really good, like to read it. Thanks for the giveaway. Mmm, mint chocolate chip or moose tracks are perfect for a hot summer day! I love butter pecan…! And Coldstone’s birthday cake…they are my favorite ice cream store! I love ice cream. Coffee ice cream is my favorite. This series sounds great — I will be looking for it! My favorite ice cream joint is COWS in Cavendish, PEI (although the one in Banff, Alberta, is pretty good, too.) And while COWS has a lot of terrific flavors, I really love their Island blueberry flavor. Too bad I’m not likely to be in Canada anytime soon!